Obviously, I have already pre-ordered this for Brett. Ladies, I suggest you do the same for the man-in-your-life. I have a sneaky suspicion this look is going to sell like hot cakes. 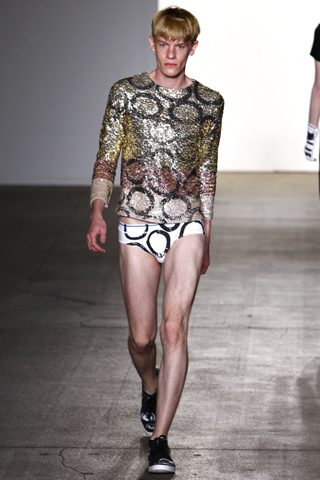 What man doesn’t need a multi-color sequins top with abstract polka dots and a matching banana hammock? According to Libertine – this is a must have for Spring 2012. I am dying to know what other ladies (and gents) think of this look. Please do share with me! ← I need a Gala, and I need it NOW! Hmmmm….I’m thinking that this might have been a little less repulsive if the guy had been a tiny bit attractive. This poor fellow looks as if he hasn’t eaten in a week and like he’s NEVER seen the sun. If this look does come into fashion, please be sure to warn us before I walk out and see my neighbor in his weirdo undies and flashy get-up. 😉 Thanks for sharing! What guy would strut his stuff in this get-up? I’m glad I’m not his mother! UUUGGGHH!! Although he doesn’t appear to have them…it did take some large “kahoonies” to model this outfit!